This week, Temwa are celebrating some of the brilliant women who are part of our community. On Thursday’s Women of Temwa instagram, we introduced you to Sarah – a tireless supporter, volunteer and fundraiser for Temwa. She has known our founder Jo Hook since before the charity was established and since then has been involved in numerous events and fundraisers. Plus, she’s seen the change in Usisya first hand, having visited our projects in both 2013 and 2017. I’m Sarah O’Neill, and I am a Multi-potenialite! That means I have many passions and interests in life, and try and incorporate all of them into my working life. That includes being a busy traveller, superstar organiser, and English teacher. I have just returned from a two-year contract in Malawi for an NGO called H.E.L.P. Malawi, as a volunteer coordinator and English teacher. Before that, I was in film & TV production for 5 years. My next ambition is to become a digital nomad and jet off to South America in 2018. My life goal is to become a writer. How did you first get involved with Temwa? I met Jo Hook back in 2002 before she even set up the organisation. As it started developing, from around 2005 – 2008, I decided that I would get involved with fundraising for the cause, by putting on cabaret shows. I wanted to recreate the feeling of a “late night surprise tent” you might find at a festival after 3 am, and Go Go Fandango was a very popular, fun and successful way to raise cash for Temwa. You have recently returned from living in Malawi, what is your favourite thing about the country? I have to say the Lake is the most beautiful and alluring thing about Malawi. It is said that once you have swum in that lake, you will always return, and that was true for me, and nearly everyone else I know. It is known as “Lake of Stars” as the gas lamps from the fishing boats appear like stars on the inky lake at night. And, of course, the incredibly friendly and beautiful people are also a huge highlight. Having visited communities supported by Temwa, what stands out to you? Usisya is very much a unique and special place. My first trip there was by ferry boat, and I was amazed how remote it was. I have since travelled in by car on a few occasions, but that journey is only possible at certain times of year, and is not exactly safe – the road is appalling. My first time was in 2013, and I recently went back in July 2017, and was amazed at the development happening there on the ground. There are power lines, there are crops in the fields all year round, there are more houses being built, and it is always the sign of a prosperous community when the houses start to have tin roofs, instead of the regular grass thatch. You have been involved in a lot of Temwa’s fundraising events, could you tell us about a memorable moment? One of my most challenging/gruelling events was definitely cycling to Devizes and back, some years ago. The whole day cycling had made me extremely saddle sore, almost incapable of walking, but we had to get back on and cycle back the next day. Someone went and bought loads of Pampers nappies for us to stuff down our trousers to help – we were completely unprepared and did not have the right kit! By the time I got to Bath I was SO TEMPTED to get on the train back, but in the end, I was persuaded to complete the last 15 miles on the bike. I was very glad I did it in the end. This is Women of Temwa week, could you name some women who inspire you? Having lived in Malawi for over three years, I have had the pleasure to meet so many inspiring women who are building a better life for the people of Malawi – be it through arts, environmental projects, conservation or grassroots NGO’s such as Temwa. Jo Hook always is an inspiration. I always am “hats off” to any woman who ignores the restraints of society, and goes in pursuit of adventure and travels the world – and I get to meet plenty of them! Fancy supporting Sarah on her next Temwa challenge? 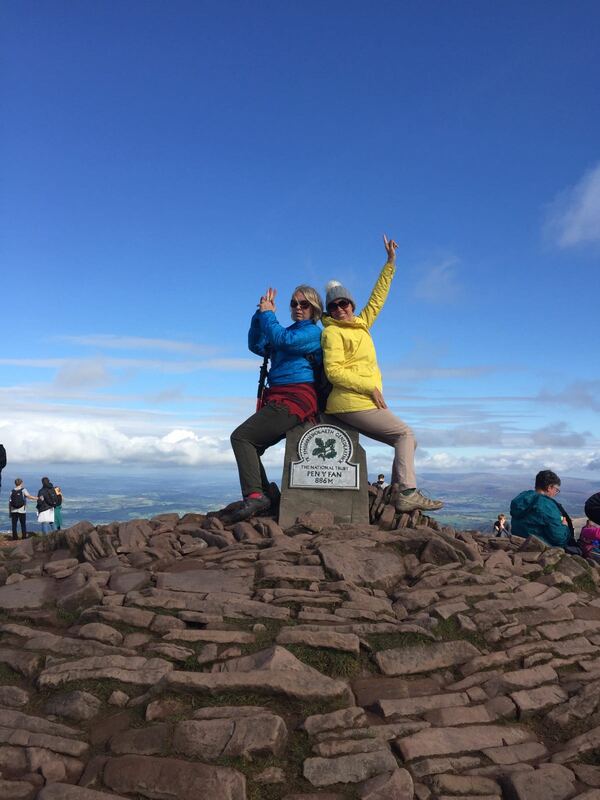 On the 21st of October, she will be Trekking 25km across the beautiful Brecon Beacons – or even better join her and the amazing group going!